A beautiful solid brass urn with highly detailed etched bands on the lid and urn. 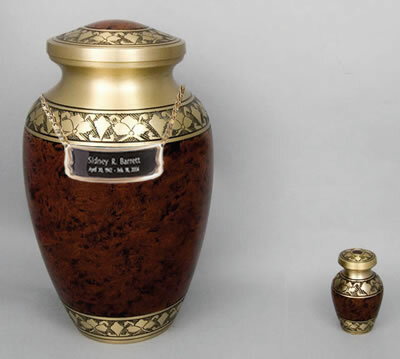 The body of the urn is an elegantly mottled reddish-brown to burgundy color. The lid screws on securely from the top. Free velour urn bag included. Optional hanging name plate available for the adult urn only. Name plates are shipped separately by ground, even for expedited orders. Usually ships same business day if ordered by 11am Eastern Time. Ships from the East Coast.